We hope you will enjoy this special opportunity to orienteer in the high alpine. This event is organized by some of Canada's High Performance Program athletes. Your race entry fee, most of which goes to supporting the HPP athletes, also includes a Peak2Peak lift ticket so after your race you can enjoy all of the lifts that are open on the two mountains, including the world famous Peak 2 Peak gondola, the worlds longest and highest lift, and access to great walks and restaurants. After the HPP Fundraiser event why not stay up on the mountain for the Mountain Top BBQ. 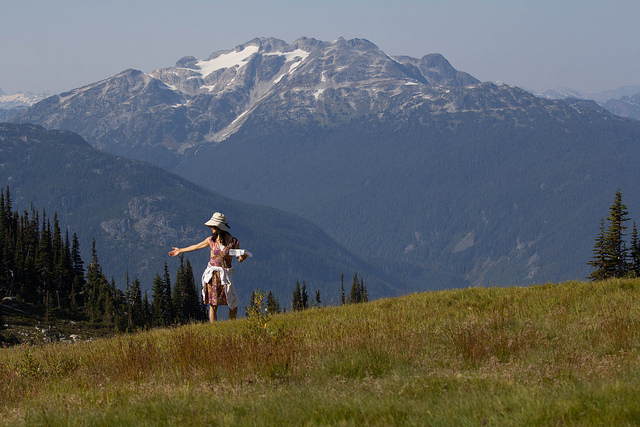 Whistler/Blackcomb are offered a 15% discount to orienteers - click here for details. To get to the event take the Whistler gondola up to the Roundhouse (approx 20 minute ride). See the overview map. At the top, go into the Roundhouse and upstairs and straight ahead into the Valley View room. The event organizers will be here - or if the weather is nice they might be out of the patio overlooking the big inukshuk. Here you will enter your time prediction, leave your timing gear, etc. Prize: $150 gift card from the O-Store for the winner! Go slow or go fast, whatever you want. There is one course for all. Advanced navigation, not suitable for beginners or children, but they can go together with adult. Place your guess with the HPP athletes at the Roundhouse before you start. Closest guess in number of seconds wins $150 gift card for the o-store. In case of a tie, the money is split evenly. Not allowed to carry a timing device! You can leave your watch/phone with the HPP athletes in the Roundhouse. Course length is 2.1 km with 125m climb. Start whenever you want between 2pm and 3pm. Awards at Roundhouse at 4pm! Last gondola back down is at 8pm.